The Zephyr AK2136AB 36-In. Essentials Series Typhoon Under-Cabinet Range Hood, in black, was designed based on the idea that the strict geometry of the under-cabinet range hood could use some serious updating. First, Zephyr crafted a smooth, sophisticated curvature. 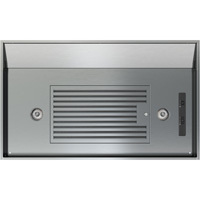 Then, they pumped up the volume with a powerful, virtually noise-free 850-CFM blower. The dimmable halogen lights invite you and your guests to a warm respite from the everyday. With the Zephyr AK2536B 36-In. 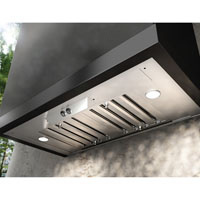 Essentials Series Hurricane Under-Cabinet Range Hood, in black, high tech meets high style with a minimum amount of fuss. Sensitive touch-controls take charge of the three-speed 695 CFM blower, dual-level halogen lights and a timed delay-off function - all of which are designed to make your life just a little bit easier. With the Zephyr AK2536W 36-In. 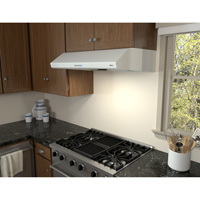 Essentials Series Hurricane Under-Cabinet Range Hood, in white, high tech meets high style with a minimum amount of fuss. Sensitive touch-controls take charge of the three-speed 695 CFM blower, dual-level halogen lights and a timed delay-off function - all of which are designed to make your life just a little bit easier. The Zephyr AK6536B 36-In. 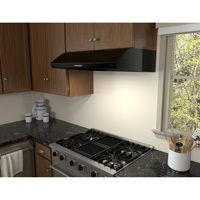 Essential Series Cyclone Under-Cabinet Range Hood, in black, features modern, clean lines that provide a perfect complement to any kitchen's interior. 650 CFM centrifugal blowers liquefy cooking residue without complex filters to make cleaning a snap. At 36 in. 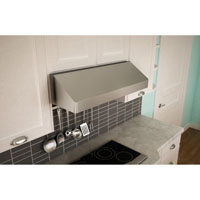 wide, this range hood is perfect for smaller kitchens while the attractive stainless steel exterior fits into kitchens of any design or color. The Zephyr AK6536S 36-In. 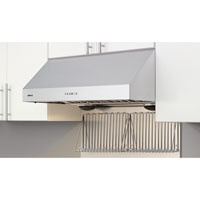 Essential Series Cyclone Under-Cabinet Range Hood, in stainless steel, features modern, clean lines that provide a perfect complement to any kitchen's interior. 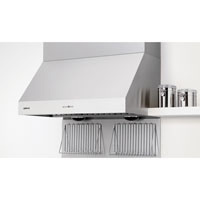 650 CFM centrifugal blowers liquefy cooking residue without complex filters to make cleaning a snap. At 36 in. 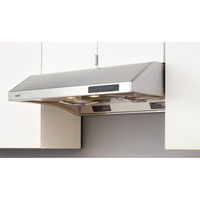 wide, this range hood is perfect for smaller kitchens while the attractive stainless steel exterior fits into kitchens of any design or color. The Zephyr AK7548BS 48-In. 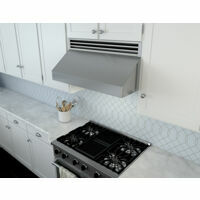 Essentials Series Tempest II Pro-Style Range Hood is designed with professional-grade performance and seamless contours in mind. 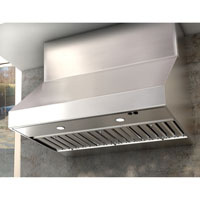 The wall-mount hood gives you serious cooking power with up to 650 CFM blower-power. 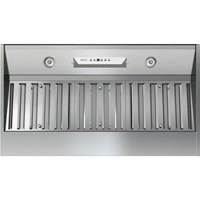 Equipped with dishwasher-safe, high-airflow baffle filters, an optional wireless remote control, 6 varied speeds, and dual-level halogen lighting, it's everything a demanding cook could ask for. 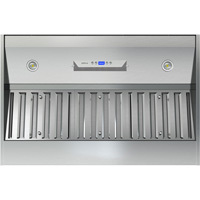 The Zephyr AK8400AS 20-In. Tornado Mini 290 CFM Power Pack was designed with cost efficiency and versatility in mind. Tornado Mini's small footprint fits under a standard 12-In. 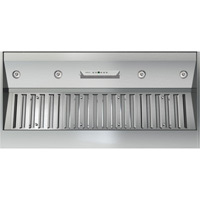 depth cabinet or choose one of our optional adjustable-depth stainless steel liners to accommodate custom hood enclosures from 17-1/8" to 20-1/2" deep. 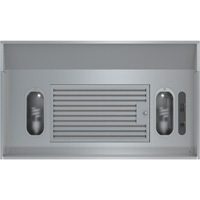 Features include dual level halogen lights, an ultra-quiet blower and a recirculating option for ductless installations. 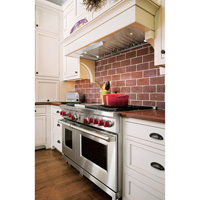 The Zephyr Essential Power Series AK9028AS-ES Vortex One-Piece Liner leads the way with the industry’s only adjustable-depth installation dimensions. 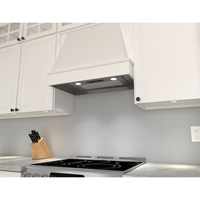 Staying true to its one-piece liner roots, the Vortex has a single liner piece that is designed to extend up to 3-inches towards the front of the range hood so you can install it in spaces built for a hood up to 20-1/2-inches deep. 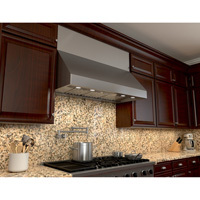 The Zephyr Essential Power Series AK9034AS-ES Vortex One-Piece Liner leads the way with the industry’s only adjustable-depth installation dimensions. 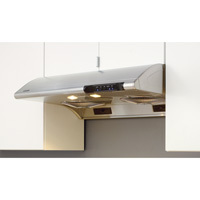 Staying true to its one-piece liner roots, the Vortex has a single liner piece that is designed to extend up to 3-inches towards the front of the range hood so you can install it in spaces built for a hood up to 20-1/2-inches deep. Monsoon I has taken the one-piece liner to the next level. Including dual-level halogen lights and an ADA-compliant RF remote you can easily control Monsoon I without ever reaching over a dangerous cooking surface. 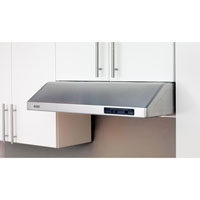 Equipped with 6-speed electronic controls, pro baffle filters and either a powerful blower technology, the Monsoon 1 is sure to make any kitchen setting safer and sleeker.